The Takeaway: Our recent webinar conveyed some important information about modern commerce, product content, Google searches and driving sales. Good thing we've complied the most essential takeaways. "The way we shop has changed"
Those are wise words from Michelle Burtchell, vice president of marketing at Salsify, who recently joined Jason Bell, senior retail search manager at CPC Strategy, in a webinar explaining how brands can turn shoppers' Google Searches into sales. But that certainly wasn't the only important thing that was discussed. So, we've compiled the five most essential takeaways from that webinar to give everyone some insight into how they can improve their sales strategies in the age of distribute commerce. 1. You need great content to shine in the new world of distributed commerce. As Michelle reported, product content is the No. 1 criteria for 73 percent of consumers when searching for and selecting items online and in-store, and 82 percent of shoppers browse on mobile while in physical shops to help fuel their purchase decisions. "To discover product information, people go to Google." That's not all. 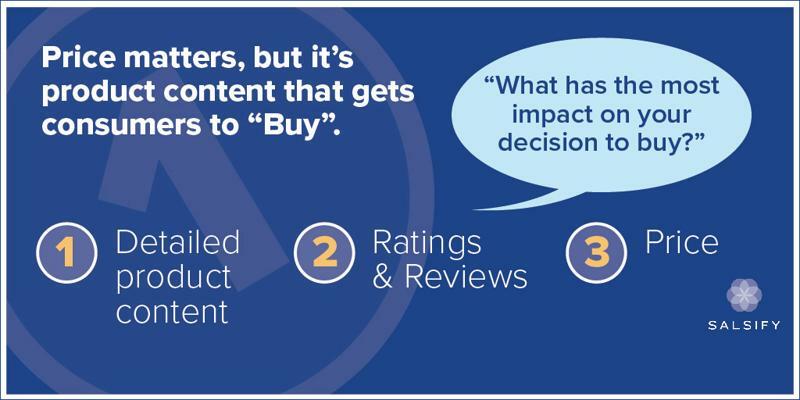 Some more recent data from our Cracking the Consumer Code report indicated that 88 percent of people consider product content extremely or very important when buying items. Furthermore, we found that 94 percent of consumers will either abandon a site or simply give up if they can't find the information they need to make a smart purchase. And to discover that information, people go to Google, the most popular search engine in the world. The point here is simple: If your product content can't be found, not much else matters. Therefore it needs to be rich - detailed, high-quality, accurate - or you can't succeed in the age of distributed commerce. 2. Brands can directly influence how their products are displayed on Google Shopping, and that's super important. Google knows that product content sells. Its research proved that the better that information is, the more likely that consumers can find and learn about your products. So, Google opened the doors to the Google Manufacturers Center for brand manufacturers to help those companies get great content to market. That allows brands to own their digital shelves by creating and distributing product content on Google Shopping, in general search results and on mobile devices. All you need is a product content management system to act as a central source of information that streams your product content directly into Google Manufacturers Center. 3. More detailed product information = more traffic. In closed testing, PLAs with short descriptions that were expanded to include more attributes like product material and colors caused impressions to rise between 10 to 20 percent. PLAs with color modifiers (that aren't brand specific) in the title attract 20 to 30 percent more impressions than titles lacking those key attributes. When brand prefixed titles were added to PLAs, businesses saw impressions grow as much as 70 percent. The bottom line: The more detailed your product information is, the more likely that customers will see and then click on your products. 4. Accurate and detailed product content drives sales. Impressions don't matter if shoppers aren't clicking "buy," right? Well, the good news is that accurate and detailed product content helps consumers find your products faster and easier, and that means more sales. We're not joking - Google did the math: Speakman, brand manufacturer of high-quality shower and bath products, saw an 8.1 percent lift in conversions when they improved their product content on Google. The lesson is that higher quality data helps users evaluate products better, and when they're informed, shoppers can't help but click "Buy." Download our "Cracking the Code: Product Content Drives Conversion report" today. 5. Product content optimization is an art and a science. Put brand names in the front of titles. Include color, size and gender in PLAs. Use MPNs and style numbers - especially if you're an electronics or appliance brand. Don't excessively capitalize (if everything is important, then nothing is, and Google will dock you for that). Beyond that, how you finish the product content game is strictly up to you since you know your brand, your shoppers and what works in that regard. Jason recommended testing different titles and trying things out to learn how to best improve product content on Google with respect to your business alone. And we completely agree. To dig deeper into what really turns Google searches into sales, check out the webinar for yourself, read our most recent consumer research report. You can also contact us directly with our questions and learn how to get started with Google Manufacturer Center.